I will present my high-z quasar selection method using SED fitting and its application to the first HSC-SSP data. While it is a well-known problem that the classical quasar selection based on two colors suffers from contaminating sources such as brown dwarfs, photometric redshift with multi-color photometry is a complementary way to effectively isolate high-z quasars. Since photo-z for AGN has been less explored comparing with photo-z for galaxies, I have developed template SED fitting method by myself to construct the largest z>6 quasar sample with the HSC survey. In this talk, I will show how our selection works on the existing quasar samples such as z>3 quasars in the COSMOS field, and then report the result of the first application to the HSC-SSP data products, which results in five z>6 quasar candidates including one possible highest-redshift (z_photo=7.3) quasar. Observation ExperimentⅠA [ Experiment by Subaru ] Report English ver. Graduate students from SOKENDAI (The Graduate University for Advanced Studies, Japan) conducted observation during the first half night of November 6, 2014 using Subaru Telescope. 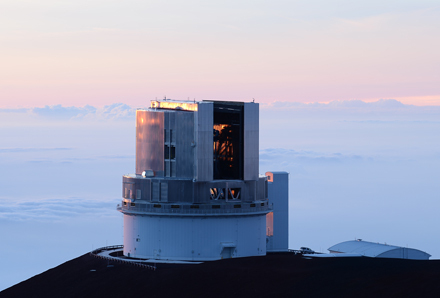 With the guidance and advices from the staff of the Subaru Telescope, they studied the surroundings of a quasar with Multi-Object InfraRed Camera and Spectrograph (MOIRCS). A faculty of SOKENDAI reports how the observation went. The target of the night is a quasar of which luminosity is as much as 100 times greater than the entire Milky Way Galaxy. The source of energy is attributed to a super massive black hole in the nucleus of a galaxy in a great distance. Due to the large amount of their energy, it is possible to observe quasars even though they are far away. How the quasars came to be? One of the mechanisms that might have contributed to them is the active star formation in their host galaxies. The indicator of such activity is the ionized hydrogen gas and the distribution of such gas can be detected in the specific emission lines in the spectrum, such as the one called H-alpha line. This line is in the visible wavelength, but shifts into the near infrared because the object is at the redshift z of 2.2. Use of MOIRCS, which has a wide field view as a near infrared imager, helps find such active star forming regions. The observers of the night are the graduate students from SOKENDAI. SOKENDAI is a unique education-research facility in Japan, with only graduate course and bases on national institutions. National Astronomical Observatory of Japan serves as the Department of the Astronomical Science in SOKENDAI. It is important for a research facility to help grow the next generation researchers. 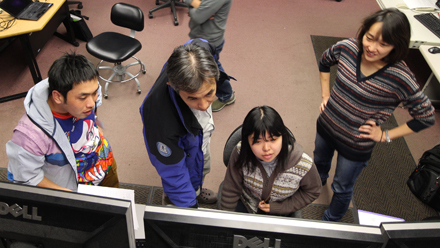 Hence the staffs at Subaru Telescope assist and give advice to the graduate students’ learning. The students took turns to intently monitor the observational condition, evaluate the data quality, and quickly adjust the integration time accordingly. 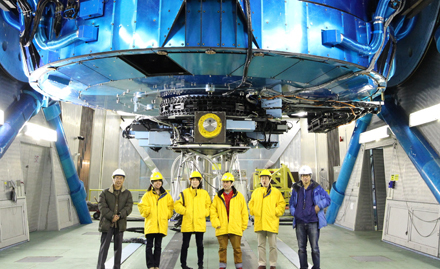 By conducting observation at Subaru Telescope, they get credits for their course work. The faint signal from the distant universe is not readily noticeable in the quick look data. The high cloud somewhat diminished the signal, but never the enthusiasm of the observers.